COMPLETE IMAGE & SPEC DETAIL PAGE CLICK HERE! • Larrivée will handle all CITES / US Fish and Wildlife fees for International Customers. Larrivée Leather Accessories by KOCH! Larrivée and the Koch Leather Co.
are happy to announce the launch of our complete line of Larrivée and JCL leather accessories. 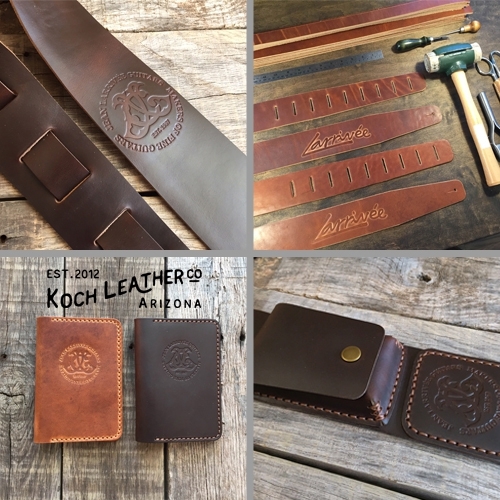 We searched North America for the finest leather crafters around and we found the KOCH family in Eastern Arizona. All KOCH leathers are precision hand-made, hand-stitched using ONLY 100% Horween leather of Chicago. We chose Josh & Jen Koch for two reasons, the first is obvious, their product quality is absolutely incredible. The second reason, their business philosophy. Similar to Jean Larrivée, Josh & Jen want to put their high-end products in to the hands of everyday people at an affordable price, and it shows. Not many businesses can say that today. Our entire line was designed by Larrivée and the Koch family, for Larrivée. Two families of artisans coming together to bring you a spectacular product that is personal and remarkable. Please visit the Koch Leather Co. website and see why we partnered with the Koch family. 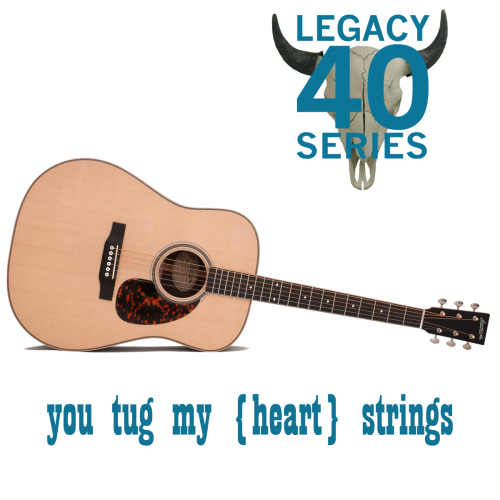 The 40 Legacy Series has taken to the hearts of players both contemporary and traditionalists alike. While maintaining our unmistakable tone, we have managed to deliver a spirited dynamic bass response through our new, non-symmetrical scalloped lateral cross-bracing system. What does all that mean? The Larrivée 40 Series packs a punch with it's gritty, "low-end growl". OM-40 review. D-40 review. Built in America using only the highest quality materials, the 40 Series is our hottest selling guitar. Available in Rosewood and Mahogany as standard, custom wood options are always available. Keep an eye out for limited runs through select dealers and as we head into new seasons as well. For complete specs, check out both the 40 Mahogany Series and the 40 Rosewood Series. Nobody Does It Like Jean! When it comes to sourcing the finest tonewoods in the world, nobody can pull it off like Jean Larrivée. He is a master guitar maker with a passion for traveling the globe in search of the finest fibers. Whether it's clambering through the jungles of India for Rosewood and Silver Oak or climbing through shipping containers arriving from Africa on the shipping ports of Southern Europe. Sometimes it's day's or weeks in the Alps going through thousands of Spruce sets selecting only the finest. There is no doubt the work is demanding but for Jean, it is a labor of love. From the steep cliffs of the tropical Hawaiian Islands, the Koa on this LV-10KK Custom is a testament to Jean's dedication sourcing the finest fibers on the planet. For complete photos and specs click here. For other available custom exotic woods, please contact your Larrivée dealer. Custom European Ash Limited Run! The Larrivée family has done it once again! Sourcing the globe for some of the finest and most exotic woods available. This time it is a rare find of European Flamed Ash for an 03 Series limited run. When a cutting sound is needed, with power, attack, punch and high harmonics, Euro Ash is candy for your ears. Limited to 23 pieces: 10 Dreadnought, 10 L-Bodies, and 3 Parlors. The Flamed Euro Ash 03 Series specs will feature an exclusive custom marquetry Ash Leaf headstock inlay design by Wendy Larrivée. Premium Flamed Euro Ash back & sides accented by Indian Rosewood binding. Complete with all bone hardware and signed label, this limited Euro Ash run will ship to dealers in approximately 10 weeks. Retail price for these limited beauties is set at $1998 MSRP. Below is an up to date list of select dealers currently with orders in. Call and inquire with your dealer today. This list will be updated until all 23 pieces have been sold. Some dealers have multiple orders. addition to our interactive website. The automated "Manufacture Date Lookup". Until recently, all manufacture date requests had to be processed manually. This was in part due to several serial number format changes over the decades. Now serial number requests can be processed instantly. This is a great tool for dealers on trade-ins, repair techs requiring spec dates and customers looking to purchase used guitars privately. Or simply to know a little more about your stringed companion. You will find the new Manufacture Date Lookup located in the "Contact" drop down menu. Any guitar that was pre 1978 will require direct contact through Customer Service. No serial numbers were used up until that point, only the last two digits of the year. LIMITED EAST INDIAN LAUREL SERIES! Larrivée's latest Limited Run is now delivering. East Indian Laurel (Terminalla elliptica) is a spectacular and often overlooked species of tonewood. It has the look and feel to that of East Indian Rosewood and American and English Walnut. Known for its exceptional tap tone quality, Laurel offers up rich overtones and brilliant highs that produce an overall lively and vibrant presence. It's sound is often compared to that of Blackwood or Brazilian Rosewood. 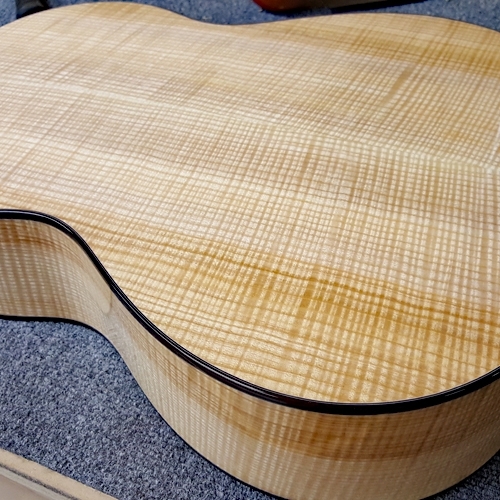 The first of these 20 Limited Laurels featuring this spectacular tonewood are now complete and delivering to select dealers. Complimenting the select East Indian Laurel back & sides is a unique Laurel leaf headstock inlay design. Each is hand inlaid consisting of 15 individually cut pieces, creating an all new and pertinent inlay for this limited run. 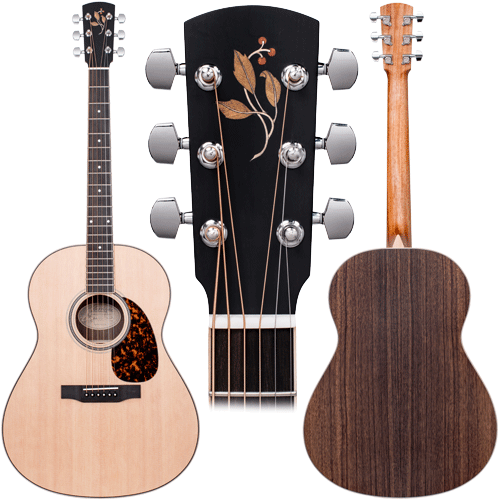 Specialty pricing for this Limited 03 Series is set at $2248 MSRP for standard body styles (L, OM, D) and $2548 for LV cutaways. Check with your dealer for availability and order now. 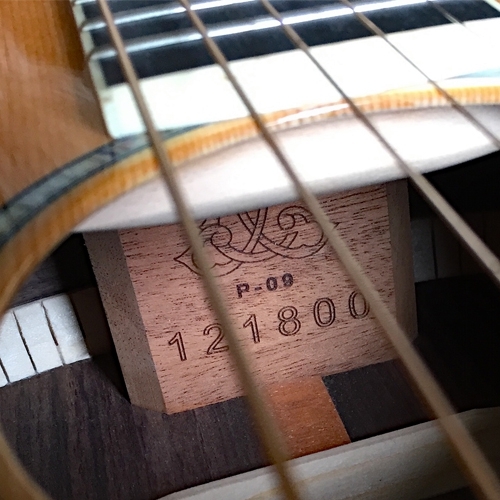 Each guitar carries Jean Larrivée's hand written signature on the inside label. Complete specs can be found in our Limited Runs & Special Editions product section on our website. For almost 50 years, Larrivée has been pulling off some of the most spectacular custom guitars around. The Larrivée Custom Shop offers a wide range of options that are listed in our downloadable CUSTOM PRICING list. Imagine, expanding your collection and designing a Larrivée that is your very own. Exotic woods that are not only visibly but sonically spectacular. Add some inlay on your fingerboard, or perhaps a figurine on your headstock. Personalize with a custom label. Fine tune your playability with a custom nut width. You are unique, your acoustic can be too. Visit our Custom Archive Section to view current and archived works. For more information on custom shop work and ordering, please contact your authorized dealer or email us at Larrivée Service. 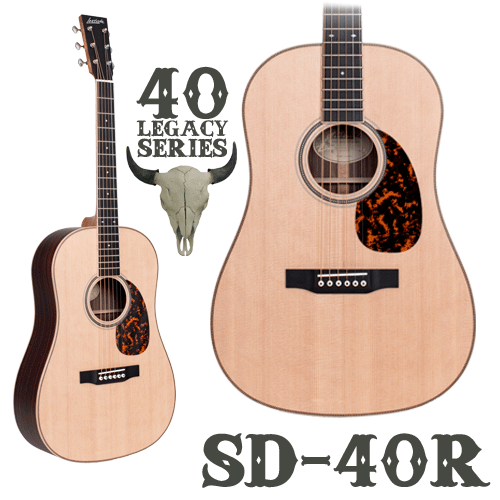 SD-40 & SD-40R have just been added to our best selling 40 Series. Our 40 Series has been gaining popularity for several years along with it's revolutionary new scalloped parabolic bracing system. Winning accolades and reviews by players and writers respectively. Our newest model to the series is the Slope Dreadnought SD body style, available in Mahogany and Indian Rosewood. 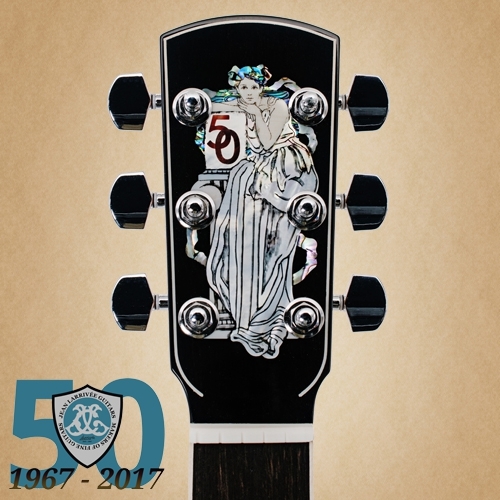 The SD body style was the earliest of dreadnought shaped guitars with soft shoulders and elongated body. Along with standard traditional features like rope purfling and open back tuners, the SD features a 12 fret neck joint and 1-3/4" nut width that make this guitar very player friendly. You will find complete detailed specs and photos for each model by clicking here SD-40R and here SD-40. LIMITED P-09 BLACK LIMBA'S ARE HERE! The Parlor craze continues! Our much anticipated Black Limba Parlor run is now available through exclusive dealers. Black Limba, often referred to as Korina, originates in West African tropical regions. Know for it's rich textures and ease of use, it also happens to be an incredible sounding tonewood. Similar to mahogany, Black Limba offers up a warm and balanced tone with rich mids. It fairs well in clarity and sustain which is a delight when performing with smaller bodied acoustics. Combine these characteristics with AAA grade Austrian Red Spruce and you have a tone generator that will leave you 'GAS'ing. This run is limited to 15 pieces and numbered sequentially, each signed by Jean Larrivée. Additional detailed specs include abalone rosette, our Vine logo inlay, Austrian Spruce bracing and Black Limba binding. MSRP is set at $3053 and all pieces are shipping to dealers now. Click here for complete photos and specs. See below for exclusive dealer list.